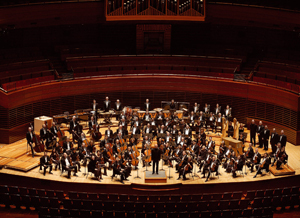 Founded in 1900, The Philadelphia Orchestra has distinguished itself as one of the leading orchestras in the world through a century of acclaimed performances, historic international tours, and best-selling recordings. Six music directors have piloted the Orchestra through its first century, giving the ensemble an unparalleled cohesiveness and unity in artistic leadership. Fritz Scheel and Carl Pohlig served as its first music directors. In 1912 Leopold Stokowski was appointed conductor. Leading a series of major world and U.S. premieres and making widely acclaimed recordings, Stokowski firmly established Philadelphia's prominence in American classical music. Eugene Ormandy assumed the music directorship in 1936. For the next 44 years, he maintained and expanded upon the Orchestra's unique artistry and musical excellence. Under Ormandy, the Orchestra refined its famed 'Philadelphia Sound' and traveled widely. Perhaps his most lasting legacy is a Philadelphia discography of nearly 400 recordings. In 1980 Riccardo Muti took over the Orchestra's leadership. He built upon the Orchestra's tradition of versatility by introducing new music from all periods. An advocate of contemporary music, Muti commissioned many new works and appointed the Orchestra's first composer-in-residence. Wolfgang Sawallisch became music director in 1993. Acclaimed as one of the greatest living exponents of the Germanic musical tradition, Sawallisch has enriched and expanded upon the Orchestra's reputation for excellence in this repertoire, while also promoting new and lesser-known compositions. This rich tradition was carried on by Christoph Eschenbach, the Orchestra’s seventh music director between 2003 and 2008. Highlights of his five seasons included the Orchestra’s first-ever multi-year cycle of Mahler’s complete symphonies; performances of all nine Beethoven symphonies, paired with music of our time, including several world premieres; tours of the United States, Europe and Asia; and the release of numerous recordings in partnership with the Ondine label. In September 2008, Charles Dutoit became chief conductor and artistic adviser of the Orchestra. The Philadelphia Orchestra performs its home subscription concerts at The Kimmel Center for the Performing Arts. Designed and built especially for the Orchestra, the Kimmel Center provides the Orchestra with a state-of-the-art facility for concerts, recordings, and education activities.